From Cooking Hacks, we are always working to find the best and cost effective shipment way for our clients. This is part of our corporate philosophy. Therefore, we are glad to announce our shipping improvement. Basically, most of shipping fares have been reduced regardless of the destination country. Besides, if the delivery has a high weight, the fee has been reduced even more. Of course, we continue working with the same courier companies (TNT, DHL or UPS), ensuring the best delivery service. For example, if you buy one of our IoT Kits to be delivered to the USA, the shipping fee has been reduced up to 50%. In case of sending an e-Health Sensor Platform Kit V2.0 to Australia, the saving is around a 40%. In case of sending our Starter Kit to Thailand, you can save around 50%. The shipping dee to send an Open Garden Hydroponics kit to Russia is reduced almost the 50%. In case of deliveries to Spain, the shipping fee starts in 5€. It means a discount of two euros less than in 2015. Also remember our free shipping policy: all orders with subtotal above 150€ are free delivered in Spain. Finally, we have removed the Handling Fee, which was a 1% commission on the price, so it also contributes to reduce these fares to the maximum. If you want to check your estimated shipping fee, you can use our Estimate shipping and tax tool. 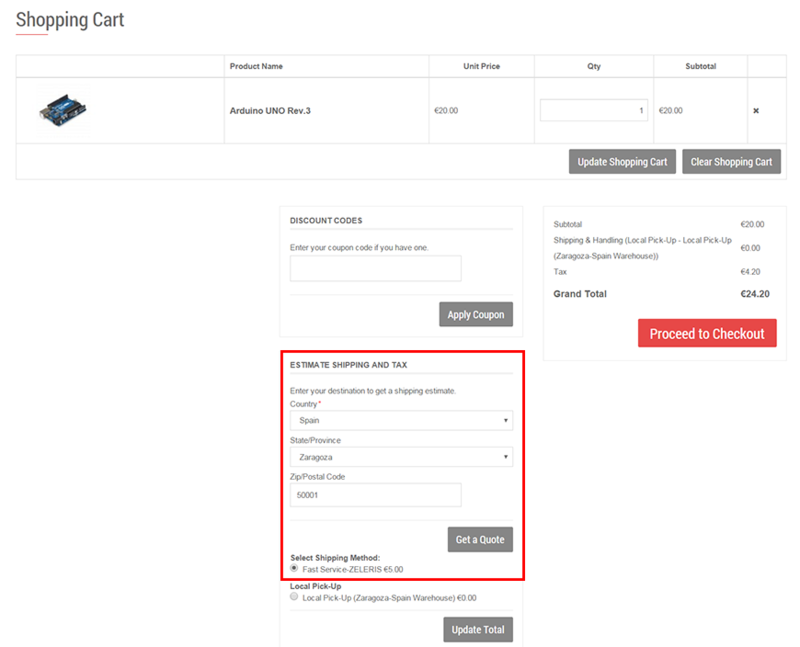 For that, you only have to go to the downside of the your Shopping Cart and there you will find the form. Fill the fields with the requiered data: Country, State/Province and Zip/Postal Code. Finally click on Get a quote button and you will get the estimate shipping fee with its corresponding courier company. Take advantage of our new shipping fees and get Cooking Hacks products with cheaper prices. Read more information about our shipping policy and other related issues in the Cooking Hacks Costumer Service. This entry was posted in Arduino, Galileo, News and Events, Raspberry Pi on February 3, 2016 by Cooking Hacks. It's Christmas, a time to be at home and rest or... Get inspired in your free time and improve your wit developing Smart Christmas gifts for all your family. Surely, you are developing a smart gadget on your Xmas time, and we thought you would like to join our community of makers and we'll reward you with a 10% discount on your next purchase. You just need to post a photo or video on our Facebook and you'll receive a coupon code for your next shopping. This is a great opportunity to inspire others to make new applications and allow us to promote your work. Take advantage and be the first one! You can start your Christmas shopping just now and get material to prepare Xmas gadgets, Noel smart decorations and wit gifts to enjoy your leisure time. An e-Health Sensor Platform to control your vital signs. A Robot Kit to create a smart toy with your children. An Open Garden solution to take care of your plants in a smart way. An Open Aquarium Kit to control water quality for your pet fish. Discover the material for your next project. Buy now! Christmas 2015. Realtime Location of Santa Claus with our 3G/GPS module for Arduino and Raspberry Pi. See the video! This entry was posted in Arduino, News and Events and tagged Raspberry Pi, Arduino on December 3, 2015 by Cooking Hacks. This entry was posted in Arduino, News and Events and tagged Open Garden, Wireless, Arduino on November 23, 2015 by Cooking Hacks. Who is going to build the projected 50 billion connected devices and Internet of Things systems slated to come online by the year 2020? Libelium is throwing down the gauntlet to empower the future IoT workforce by promoting electronics skills in universities and high schools, offering specialized training and a contest to rank and reward the most promising developers and their educators. With technology advancing at a rapid clip, Libelium’s IoT Spartans challenge intends to bridge the gap between the skills today’s employers need and the career development of a new, emerging IoT workforce whose products and services will touch every sector of the global economy. The IoT Spartans Challenge is available to individuals and educational institutions, with free online registration open between December 16, 2015 and January 31, 2016. In 2016, from February 1 through June 10, participants may attend webinars covering IoT concepts using the Waspmote IoT development platform, and take quizzes and exams. A ranking of the top 300 IoT Spartans will be published every month between February and June 2016. The top three developers will win cash prizes ranging from 500 Euros to 3,000 Euros for individuals, and the highest-ranking educational institution will win 5,000 Euros in equipment from the Libelium catalogue. Technology, engineering, and electronics students can nominate their professors and teachers to participate as IoT Spartans Ambassadors. This entry was posted in Maker Events, News and Events, Waspmote on November 10, 2015 by Cooking Hacks. Autumn is a pretty busy time for makers, full of hackathons and faires everywhere. Here in Europe we have one of the largest events, Maker Faire Rome, where more than 90 thousand people attended last year, and apart from that, just in October our friends in Denmark (Aarhus), Turkey (Istanbul), Spain (Santiago de Compostela) and Finland (Espoo) will enjoy their own mini maker faires. In the 2015 edition of Maker Faire Berlin over 120 booths will be available for companies and makers to present their inventions and devices. All throughout the weekend there will be talks and showcases, and workshops where you'll be able to learn about 3D printing or how to connect your sensors to the Internet. We will be visiting Maker Faire Berlin 2015, where we will promote the IoT Spartans Challenge, among other things. A while ago we decided in Cooking Hacks to focus extensively on technical education. This was made to meet the increasing demand for IoT developers. An article by Gartner predicted 4.9 billion things connected to the Internet in 2015, and up to 25 billion by 2020. IoT is already having a large impact on industries like utilities, manufacturing and transportation and expanding more and more to government and city councils. We thought we had to do something about this situation, so we prepared 20 new kits, specially oriented to education and covering all kind of sensors and wireless technologies. Theses kits, along with over 100 step-to-step tutorials, provide a solid basis for students and future IoT developers. Another initiative from Libelium and Cooking Hacks in this aspect is the IoT Spartans. This challenge, to be launched later this year, will identify and give public recognition to the best developers. Libelium will give webinars on Waspmote, where participants will learn how to use this platform as a development tool for the IoT. After that, the Spartans will take several tests where they will prove their skills, and will be later ranked monthly in a public list with the top developers. The best 3 developers and the best university will have money prizes at the end of the challenge. Don't forget to look for the IoT Spartan around the Maker Faire (logo on the left) and join in! Read more about Libelium IoT Training here. Maker Faire Berlin will take place at Postbahnhof am Ostbahnhof, Straße der Pariser Kommune 8.Check a map here. This entry was posted in Arduino, General, News and Events, Raspberry Pi, Waspmote and tagged Raspberry Pi, Waspmote, Arduino, makers on September 28, 2015 by Cooking Hacks. Cooking Hacks was part of the recent Sónar Festival 2015 in Barcelona. Sónar is a three-day long electronic music festival that was founded in 1994, and has since evolved into a multi-themed event that includes all kind of artistic performances and multimedia exhibitions, enhancing creativity and technology. It is divided into Sónar by Day and Sónar by Night and, unlike most summer festivals, it does not take place in a field. Sónar by Day is located in the city centre (Fira Montjuïc), and apart from concerts and dj's it hosts showcases and expositions, and the Sónar+D, an international conference focused on creativity and technology, and the digital transformation of the cultural industries involved. It gathers not only artists but entrepreneurs, researchers and companies seeking to integrate music, technology and business. Watch below the intro video for the Sónar+D. Sónar by Night is located at Fira Gran Via de L'Hospitalet, far away from the city centre, with most part of the live shows and dj sets until late at night. Libelium attended Sónar with "Sensors for the Next Generation of Artists", a demo of some of our products and the projects explained below, and participated in the "European Commission: Open Digital Science and Art Workshop", which featured representatives from principal institutions involved in research, art, technology and culture. So this is what we brought to the table. This project is a mind controlled fridge, so you can get a cool drink without physical interaction. A mindwave sensor measures brainwave signals and monitors the attention level of the user. This sensor uses the Bluetooth module PRO from CH to send the data to an Arduino Uno board. The Can Dispenser is controlled with the Arduino Uno, which collects the data from the Mindwave and displays your concentration levels in an LCD screen and an analogic gauge meter. So all this means that when you concentrate hard enough you get your drink: Inside the covering there is a thermoelectric cooling that uses the Peltier effect together with a fan to create a flow of fresh air. Galvanic Skin Response Sensor (GSR - Sweating): Skin conductance, also known as Galvanic Skin Response (GSR) is a method of measuring the electrical conductance of the skin, which varies with its moisture level. Skin conductance is used as an indicator of psychological or physiological arousal. Pulse and Oxygen in Blood Sensor (SPO2): Pulse oximetry is a noninvasive method of indicating the arterial saturation of functional hemoglobin. Oxygen saturation is defined as the measurement of the amount of Oxygen dissolved in blood, based on the detection of Hemoglobin and Deoxyhemoglobin. The Arduino Board reads the data from the sensors and sends it to the printer with our RS-232 Serial/Modbus Module. This module allows to connect console ports and special purpose equipment. So, in the end you will get a ticket from the printer with the measured levels and depending on them it automatically assigns you a party level: relaxed, normal, semi-altered, altered or super-altered. The Partymeter makes use of the e-Health Sensor Shield, a board by Cooking Hacks that allows Arduino and Raspberry Pi users to perform biometric and medical applications where body monitoring is needed by using 9 different sensors. 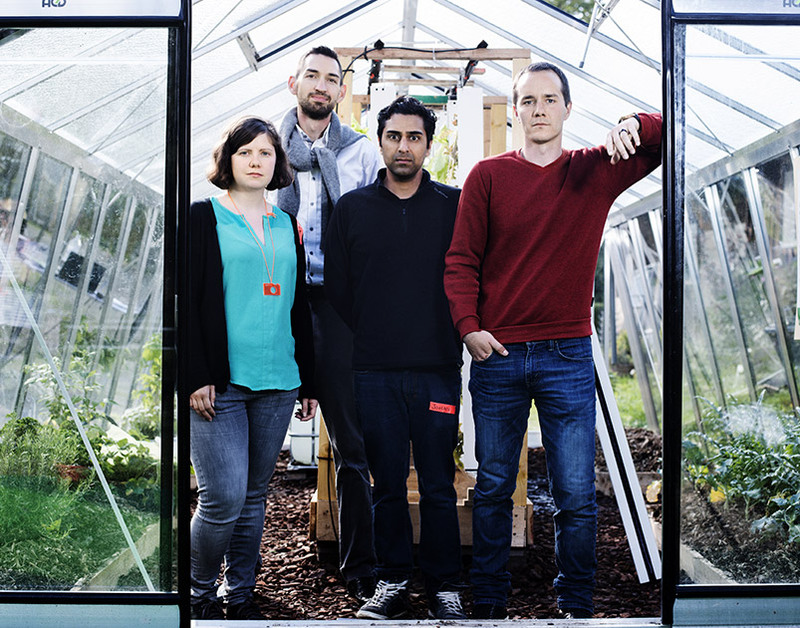 This project was developed by Cooking Hacks and it converts ambient radioactivity in a musical rhythm. It detects radiation with a Geiger-Müller tube, a type of particle detector that measures ionizing radiation. It is able to detect the emission of nuclear radiation, including alpha particles, beta particles and gamma rays. The Geiger Counter is integrated in the Radiation Sensor Board. This board is compatible with any tube that works in the range of 400V - 1000V and, in this case, is mounted on an Arduino Uno, but it is also compatible with Raspberry Pi and Intel Galileo. It has 5 LEDs and an LCD to indicate radiation levels and a piezo speaker that allows to hear the typical "chirp" in radioactivity counters. To quickly detect increases in radiation levels we use a Vaseline glass bead. This is a safe way to test your Geiger Counter: Vaseline glass contains a small amount of Uranium (less than 0.2%) so it is slightly radioactive but completely safe to handle. The Arduino and the Radiation Sensor Board are placed inside a covering, so put some Vaseline glass bead next to it and the music starts to play. We are very much looking forward to the next edition of this festival. We'll see you there! This entry was posted in Arduino, News and Events and tagged Arduino, e-Health on June 23, 2015 by Cooking Hacks. 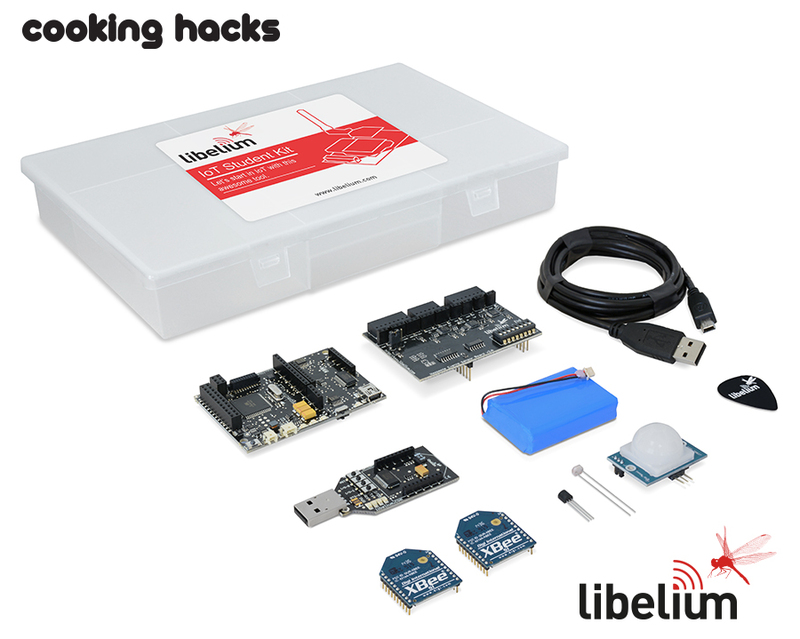 Cooking Hacks, Libelium's DIY open source hardware division, is reorienting towards technical education. This is made as a response to the increasing number of connected things: it is predicted that by 2020 around 25 billion devices will be connected to the Internet, resulting in a need for companies to look for more than 4 million developers. This is a huge step for us, and it is something more than a website redesign to give it a modern look. Cooking Hacks seeks to place greater emphasis on teaching, so we have prepared 20 new kits to be added to our existing kits portfolio: that makes more than 40 education kits. These new kits range from WiFi or Bluetooth to GPS and GPRS, and all of them include extra components like LEDs, resistors, servo motors or an LCD display that will allow you to make lots of projects. We have also redesigned our Starter Kit. We have included in it some very interesting new products, like an LCD 16x2 Display, a 9G Micro Servo or a Hobby Motor that will surely expand the capabilities and applications of your projects. Besides, you can purchase all the new kits with Arduino, Raspberry Pi or Intel Galileo Platforms. Just select the platform you are interested in, and fully customize your kit. You can purchase the Starter Kit even including our Waspmote Starter Kit. Our kits can now be sorted by platform, category or user level (beginner, intermediate and expert). This way you can select the right tutorial for the platform you are using and according to your experience. Since we attempt to get everybody interested in electronics and DIY, we have classified our kits by User Level so beginners and advanced users can find the most suitable kit. We have also reorganized our Kits around "Skills" and "Applications". For example, you can improve your programming skills with our Programming oriented Kits, or develop Wireless projects with our Wireless Kits. Don't forget to check our Long range Sensors Kits, where you will find some of our best-sellers. We have now over 100 step-by-step tutorials to easily learn to use our kits. You can work on any platform (Arduino, Raspberry Pi, Waspmote and Intel Galileo), and start making applications with sensors and wireless networks, regardless of your skills on electronics and programming. To make really easy to find the tutorial you need, we have developed a specific Tutorial Search Tool. You can select the platform you are interested in, the category you want to look into, and even your knowledge level, and the tool will give you back the tutorials that best match your preferences. This new improved search tool will help you to find what you're looking for in just a few seconds. We have detected in the past that some of our customers had difficulties to find products in our shop, so our IT department put a lot of effort developing this new tool. Thus, Cooking Hacks has been redesigned! As you can see it is a much more simple design, we've said goodbye to the red background, and now you can enjoy lots of white and clear spaces so you can read comfortably and navigate smoothly. And in addition to that, the entire site works now with SSL certificates signed by a third party Official Security Authority. All the transactions are encrypted, signed and 100% secure. We are using secure Paypal and Credit Card (VISA - MasterCard) payment method. You can pay also via wire transfer - we will prepare your order after the payment reception. Remember we never store your card information on our site. Libelium, along with Cooking Hacks, is focusing on meeting the demand for developers for the Internet of Things, and is offering training courses for teachers on Waspmote, our own open source wireless platform for the IoT. This new approach will include the IoT Spartans initiative, a challenge to rank the best IoT and Waspmote developers that will be launched in the next few months. More coming soon, stay tuned. This entry was posted in News and Events and tagged Raspberry Pi, Waspmote, Arduino, Intel Galileo on May 29, 2015 by Cooking Hacks. Last February Raspberry released their second generation Raspberry Pi 2 Model B to replace the Raspberry Pi 1 Model B+. We have been testing our Raspberry Pi to Arduino shields connection bridge for the past weeks to be sure it is fully compatible with the new model. Our bridge board was developed to function as a link between Raspberry Pi and Arduino, making it possible to use any shield, board or module designed for Arduino in Raspberry Pi. With our bridge you can connect any analog or digital sensor using the Arduino pinout but taking full advantage of the new RaspberryPi 2 capabilities. At the same time we created the arduPi library in order to use the Arduino code in Raspberry. We have implemented conversion functions so you can control any I/O interface the same way as in Arduino: analog, digital, i2C, SPI, UART… An updated version of this library is available here (compatible with Raspberry Pi 2). It includes a socket so that you can connect any Arduino wireless module (XBee 802.15.4/XBee ZigBee, RFID, NFC, Bluetooth, Bluetooth Pro, WiFi). You can also connect any sensor with a precision of 16b through the integrated ADC or complex sensors through i2C and UART buses. The new Raspberry is powered via microUSB socket (+5V @ 2A) so it can meet higher current requirements than its predecessor. For example GPRS and 3G shields occasionally demand high current peaks and this new board can provide them easily. Since the layout of the new model remains unchanged, with 40 GPIO and all of the connectors in the same place with the same functionality, our shield connects with it perfectly. We have been testing every Raspberry Pi tutorial on our website to ensure every functionality works fine and haven't noticed any kind of problem so we are pretty happy with the outcome. You can still use the same ARMv6 Raspbian on both Raspberry Pi 1 and 2, and because it has and ARMv7 processor, it can run the full range of ARM GNU/Linux distributions, including Snappy Ubuntu Core, as well as Microsoft Windows 10. This connection bridge allows to use our e-Health sensor platform with Raspberry Pi. With the e-Health shield you can monitor up to ten different biometric and medical parameters and create applications where body monitoring is needed. The complete kit features ten different sensors: pulse, oxygen in blood (SPO2), airflow (breathing), body temperature, electrocardiogram (ECG), glucometer, galvanic skin response (GSR - sweating), blood pressure (sphygmomanometer), patient position (accelerometer) and muscle/eletromyography sensor (EMG). Our Raspberry Pi to Arduino Shields Connection Bridge works perfect with the new board (you can pre-order the new Raspberry Pi 2 Model B board here). You can purchase Raspberry Pi to Arduino Shields Connection Bridge here. You can also purchase our e-Health sensor platfom here. This entry was posted in Arduino, General, News and Events, Raspberry Pi on March 11, 2015 by Cooking Hacks. We are happy to announce that three Coocking Hacks projects have been nominated in the Best Open Source Project category, in the 4th Annual IoT Awards hosted by Postscapes.com. We think it is a good opportunity to make a quick overview of all of them in order to remind you, our fellow users, the main features and functionalities of such a good projects. The e-Health Sensor Shield V2.0 allows Arduino and Raspberry Pi users to monitor biometric and medical parameters and create applications where body monitoring is needed. The complete kit include up to 10 different sensors: pulse, oxygen in blood (SPO2), airflow (breathing), body temperature, electrocardiogram (ECG), glucometer, galvanic skin response (GSR - sweating), blood pressure (sphygmomanometer), patient position (accelerometer) and muscle/eletromyography sensor (EMG). The e-Wheelchair project by Philip Case. Update about the e-Wheelchair project by Philip Case. Early Detection of Childhood Disease. The e-Health Sensor Platform V2.0 step-by-step tutorial. Purchase e-Health Sensor Platform Complete Kit V2.0. Vote for e-Health in 2014 IoT Awards!. 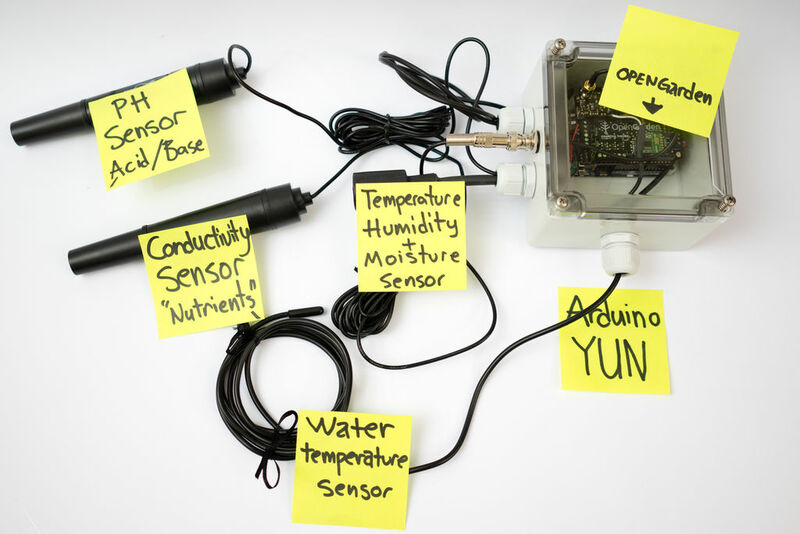 The Open Garden platform allows to control the state of the plants by sensing several parameters depending on the kit: Soil moisture (Indoor & Outdoor kits), Temperature + Humidity + Light (All kits), and Water sensors: pH, Conductivity, Temperature (Hydroponics kit). Three different kits are available, each ready for a specific kind of growing plant scenario: indoor (houses and greenhouses), outdoor (gardens and fields) and hydroponics (plants in water installations). Comparing Waspmote VS Maker Boards and Sensors for Aquariums and Gardens. First complete Open Garden projects photos . More Open Garden real project photos. The Open Garden step-by-step tutorial. Vote for Open Garden in 2014 IoT Awards!. Open Aquarium helps you to take care of your fish by automating the control and maintenance tasks that take place in the fish tanks and ponds. Two different kits are available: Basic and Aquaponics, and many several extra accessories. The Open Aquarium step-by-step tutorial. Vote for Open Aquarium in 2014 IoT Awards!. We are very happy just for the recognition of being included in 2014 best Open Source projects category of these awards. We will continue in 2015 helping to the Maker Community to create different hacks, sharing new projects, products and ideas. We invite you to vote for these projects in these 2014 IoT Awards (clic above in each link). Just till 22th January. This entry was posted in Arduino, General, News and Events on January 15, 2015 by Cooking Hacks. e-Health, Open Garden and Open Aquarium Kits 10% OFF. Just till 23th! We all know that sometimes is difficult to find the most suitable Christmas gifts for your family. That's why we have selected some kits and products that can help you to choose the perfect gift for any of the members of yours. Till next 23th December, e-Health, Open Garden and Open Aquarium Kits will be 10% OFF, 3D Printers 33% OFF and the rest of kits and Communication Shields 5% OFF. Check this infographic to know which of our products best fits every member of your family! Check all our Christmas products sales here. This entry was posted in 3D Printer, Arduino, General, News and Events on December 11, 2014 by Cooking Hacks.